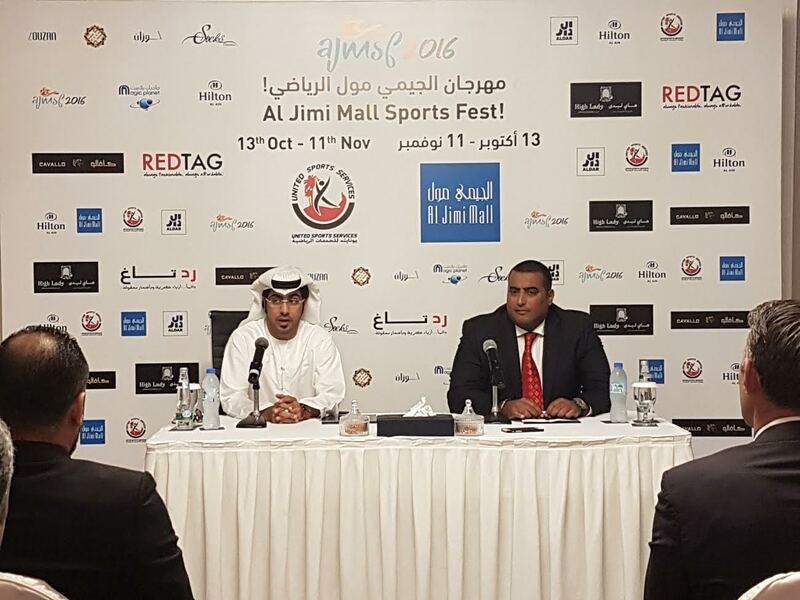 ABU DHABI – UAE: Al Jimi Mall, Al Ain’s first and premier shopping and entertainment destination, yesterday announced the much anticipated and inaugural Al Jimi Mall Sports Festival 2016 in collaboration with United Sports Services. The announcement was made at a media briefing held in Al Ain today, in presence of Wael El Barbary, General Manager of Al Ain Retail, Aldar Properties and Mubarak Al Ketbi, Chairman of United Sports Services. Al Jimi Mall Sports Festival, also dubbed as the ‘Mini-Olympics’, will be the city’s first ever inter-school sports tournament. Under-15 teams from as many as 12 Al Ain schools will participate in popular sports, including football, basketball, giant chess, volley ball and table tennis. The action kicks off on October 13 and the festivities will culminate next month with an awards ceremony that will be held ahead of the UAE National Sports Day. Participating schools include: Al Ain Academy, United Sports Academy, Al Dhafra Private School, Al Khalil International School, Al Ittihad National Private School, Al Nashaa Al Saleh Private School, Alya Private School, Emirates Private School, Al Snawber School, Future Private School, International Private School and Future School. The winners will be decided by adding up team points following completion of all the competitions in November. The winning team and runners-up will be rewarded with cash prizes while visitors can also take part in a quiz competition. All matches will take place at a sports arena that has been set up right outside the mall’s east entrance. The sports festival will be held with support from key retailers, which include; Louzan Group, Cavallo, High Lady and Red Tag as platinum sponsors, Hilton Hotel, Magic Planet and Socks Collection as silver sponsors. Al Jimi Mall is currently undergoing AED 410 million expansion and renovation project that aims to offer visitors an memorable shopping and entertainment experience, one that perfectly resonates the 15 years heritage of the mall and sets a new benchmark in both design and retail mix. Al Jimi Mall is Al Ain’s first and favourite shopping and entertainment destination offering families and shoppers a wide variety of their favourite brands in the heart of the Garden City. Aldar seeks to create quality, comfortable, desirable destinations that enrich the lives of Abu Dhabi residents as well as tourists within the Emirate. Aldar is playing a leading role in the development and provision of world class retail – Yas Mall, international standard education through Aldar Academies, iconic entertainment venues such as the Yas Marina Circuit, and community amenities across its entire portfolio. Aldar is driven by a vision to be the most trusted and recognized real estate lifestyle developer in Abu Dhabi and beyond. Previous articleSave Time and Money with Cortec’s EcoClean® Biodegradable Scale and Rust Remover powered by Nano VpCI®!